The numerical simulation of macrosegregation formation during the horizontal solidification of a Sn-3 wt%Pb alloy in a rectangular cavity is presented and compared to experimental results. The benchmark experiment consists in solidifying a rectangular ingot of Sn-3 wt%Pb alloy using a solidification setup with a precise control of the thermal boundary conditions. The 3D simulation is based on a model formerly derived with a two-phase volume averaging technique. It is focused on the solidification stage of the experiment, during which lead segregation occurs. Both the temperature field measured in situ during the solidification and the post-mortem observations of macrostructures can be compared with the numerical simulation results. These comparisons are rather good : the evolution of the temperature field during the solidification process is well reproduced, and the main zones of lead enrichment are recovered. A particular focus is made on the segregated channels development mechanism, as well as their size and geometric shape. 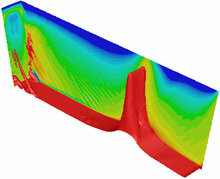 They are observed to grow in the vicinity of the side walls and to feature a curved tubular shape in the simulations.